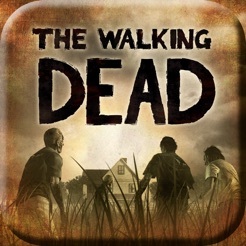 The Walking Dead is a five-part episodic game series set in the same universe as Robert Kirkman’s award-winning comic books featuring Deputy Sheriff Rick Grimes. This is not another shoot ‘em up; it’s a game that explores some very dark psychological places, revealing that the undead are not the only thing to be afraid of when society crumbles. In this brand new story, you are Lee Everett, a man given a second chance at life in a world devastated by the undead. With corpses returning to life and survivors stopping at nothing to maintain their own safety, protecting an orphaned girl named Clementine may offer him redemption in a world gone to hell. Experience a dark, visceral and emotional series where every action and decision you make can result in the story changing around you. This tailored experience means that your story could be very different to that of someone else. 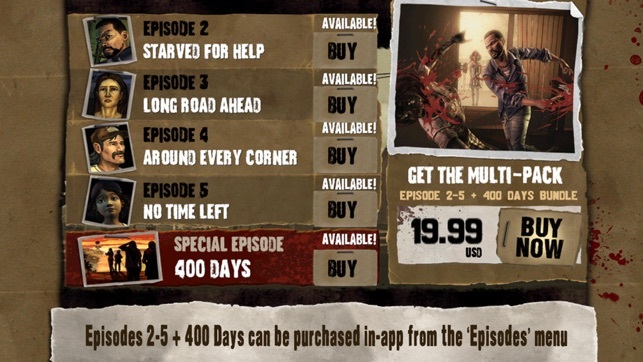 All individual episodes, plus Special Episode: 400 Days are available via in-app purchase. 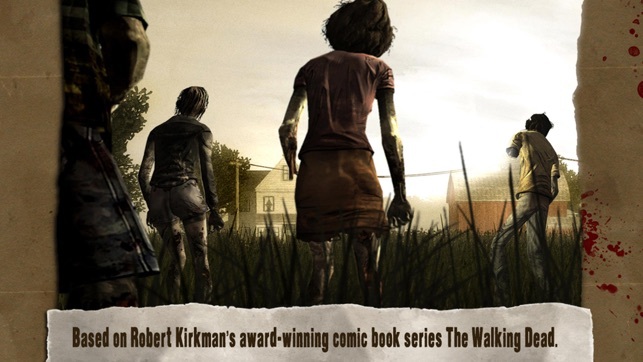 •Based on Robert Kirkman's award-winning comic book series: The Walking Dead allows gamers to experience the true horror of the zombie apocalypse, with artwork inspired by the original comic books. 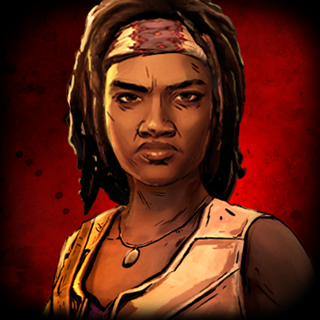 Live out events, meet people and visit locations from The Walking Dead lore. 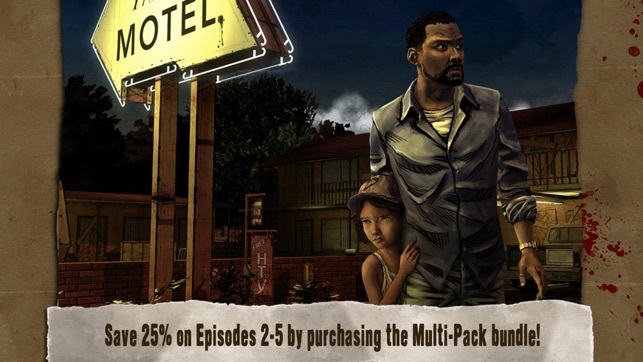 •A tailored game experience: Live with the profound and lasting consequences of the decisions you make in each episode. Your actions and choices will affect how your story plays out across the entire series. •Act fast: You'll be forced to make decisions that are not only difficult, but require you to make an almost immediate choice. There's no time to ponder when the undead are pounding down the door. 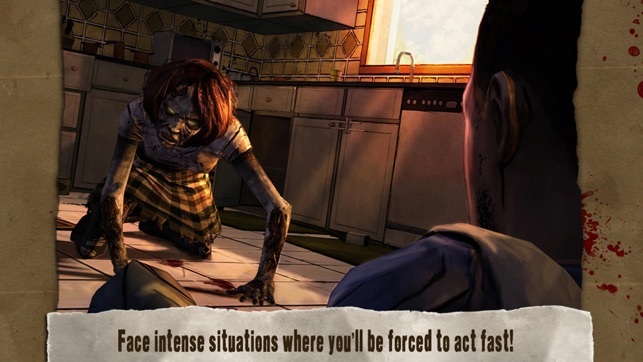 •Adventure horror spanning across five episodes, plus special episode '400 Days': Gameplay involves meaningful decision-making, exploration, problem-solving and a constant fight for survival in a world overrun by the undead. Experience the game that reinvented the interactive adventure genre. 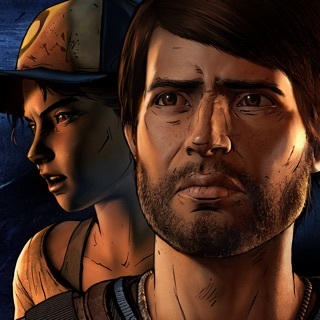 Robert Kirkman’s undead universe comes to life via the talented team at Telltale Games, and every choice you make has life-and-death consequences. Scavenge for supplies, build alliances, and ultimately decide who lives and dies one choice at a time… just make sure you don’t lose your humanity along the way. The story is good. There's no doubt in that. But the game was likely not made with the mobile platform in mind, resulting in confusing, clunky movement and camera controls. It's also a choice-heavy game with no option to save manually or skip cutscenes (many of which are unnecessary and lengthy). So it means if you were to alter the outcome of a choice, you often have to replay a good 10+ min of game, rewatching the characters engage in boring, mundane activities such as opening a door (every door-opening in this game has a long cutscene. For atmospheric reason I understand why, but they should only play once). Did I also say you are likely to get some dialogue options wrong? 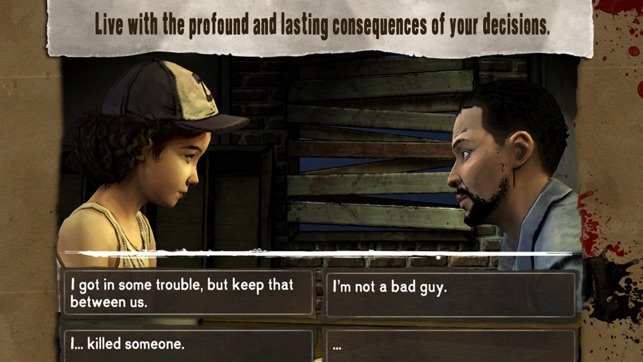 Not because you would regret your choice, but many dialogue choices do not reflect what your character would actually say. The choices are a short version of your character's often emotional, long response, and there were moments that I went "wait, I did not mean it that way! I did not know you'd say it like a jerk...guess I'll have to rewind again." The game would be much better if it were not so frustrating at times. I recommend buying the PC version, which at least has slightly better navigation. I purchased this game in 2013 on my iPhone 5s, so when I got the iPhone 7 this year I wanted to play this game all over again. I was having trouble, at first, restoring my $20 purchase. Thankfully, after researching the issue, I realized it was mostly user error on my part. They have trouble restoring purchases on new devices but there is actually a simple way to make it happen if you follow directions correctly. It's found on their website. Overall, this game holds up really well for being five years old and on a cell phone! It has a significant amount of choices that really do affect your outcome in quite a few ways and it ran really smoothly on my phone as I played. It's really odd to read such horrible reviews from a couple of people. However, nothing really gets 100% positive reviews. Just the world we live in. 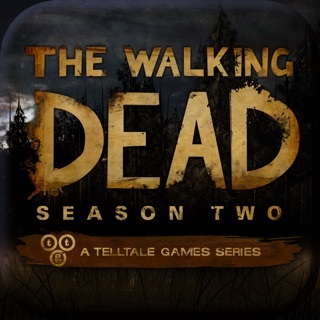 ©2012-13 Telltale, Inc. THE WALKING DEAD is TM and ©2013 Robert Kirkman, LLC. Based on the Comic Book by Robert Kirkman, Tony Moore and Charlie Adlard.